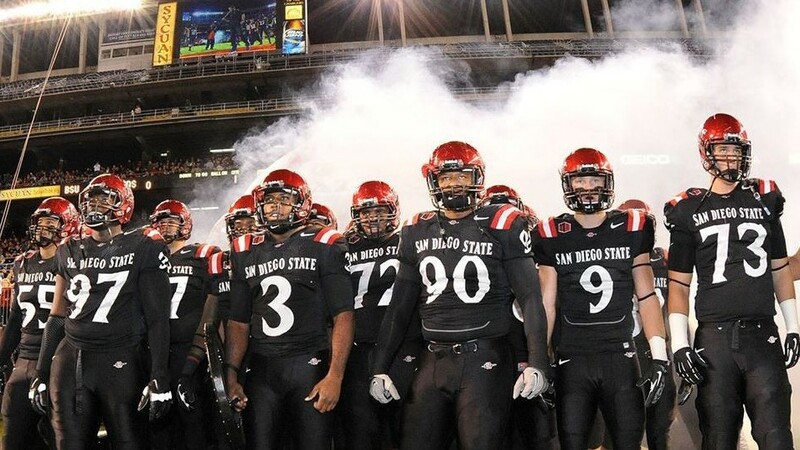 As expected, the San Diego State football team cracked the top-25 rankings Sunday in both the Associated Press and Amway Coaches polls after upsetting its first ranked opponent of the season Saturday. SDSU is ranked No. 22 in the AP Poll with 201 points, ahead of Utah (194), Oregon (158) and LSU (153), and No. 25 in the Coaches Poll with 141 points (up from 19 points a week ago) and 64 points behind No. 24 Oregon (208). This is the first time the Aztecs are ranked this season and the first time since finishing at No. 25 in the final polls last season. San Diego State defeated then No. 19 Stanford 20-17 Saturday with a last-minute touchdown — a second straight win over a Pacific-12 Conference team and third against a Power 5 team. It was also the Aztecs’ first win over a nationally ranked opponent at home since they beat No. 23 Air Force in 2010. “‘I’m happy for them. I’m proud for them,” SDSU coach Rocky Long said. “That was a big-time win. But we got a whole bunch more football to play. Our number one goal is to win the conference championship. Coincidentally, SDSU will face Air Force this Saturday in its Mountain West Conference opener. On Monday, team captains Kameron Kelly and Penny were both named Mountain West Players of the Week, the conference announced. Penny was named the Offensive Player of the Week and Kelly was Defensive Player of the Week. It was the first such honor of Kelly. This was the third time Penny was chosen as player of the week and the first to win three back-to-back honors since Utah kicker Louie Sakoda in 2007 and the first to three straight offensive honors since Utah quarterback Alex Smith (a Helix High grad) in 2004. In the win against the Cardinal, Penny rushed for a career-high 32 times for 175 yards (5.5 avg.) and added a career-high five receptions for 31 yards. It was his third consecutive 100-yard game and the eighth of his career, which tied for the 11th most in SDSU’s history. Kelly, meanwhile, had six tackles, with a career-high two sacks (his first career sacks), career-best two tackles for loss, his first career forced fumble and an interception. His interception in the Cardinal’s final drive helped secure a win the for the Aztecs.